How does Losec work? What will it do for me? 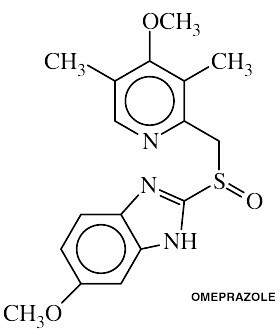 Omeprazole belongs to the family of medications called proton pump inhibitors (PPIs). It slows or prevents the production of acid within the stomach. It is used to treat conditions where reduction in acid secretion is required for proper healing, including stomach and intestinal ulcers (gastric and duodenal ulcers), the prevention and treatment of ulcers associated with medications known as NSAIDs, reflux esophagitis, Zollinger-Ellison syndrome, heartburn, and gastroesophageal reflux disease (GERD). It is also used in combination with antibiotics to treat stomach ulcers caused by H. pylori bacteria. How should I use Losec? The usual dose of omeprazole is 10 mg to 40 mg once daily, depending on the condition being treated. This medication can be taken with or without food. When used to treat stomach ulcers caused by H. pylori in adults, the dose of omeprazole is 20 mg twice daily taken with amoxicillin 1,000 mg twice daily and clarithromycin 500 mg twice daily, all for 7 days. Another dosing regimen for H. pylori infections is omeprazole 20 mg, metronidazole 500 mg, and clarithromycin 250 mg, all twice daily for 7 days. It is important that this medication be taken exactly as prescribed by your doctor. If you miss a dose, take it as soon as possible and continue with your regular schedule. If it is almost time for your next dose, skip the missed dose and continue with your regular dosing schedule. Do not take a double dose to make up for a missed one. What form(s) does Losec come in? Each opaque pink, delayed release capsule, printed in black, "10" on the body and "A O S" on the cap. contains 10 mg of omeprazole. Nonmedicinal ingredients: disodium hydrogen phosphate dihydrate, gelatin, hydroxypropyl cellulose, hydroxypropyl methylcellulose, iron oxide, lactose anhydrous, magnesium stearate, mannitol, methacrylic acid copolymer, microcrystalline cellulose, polyethylene glycol, sodium lauryl sulfate, and titanium dioxide. Each delayed release capsule with an opaque pink body, opaque reddish-brown cap, printed in black, "20" on the body and "A O M" on the cap contains 20 mg of omeprazole. Nonmedicinal ingredients: disodium hydrogen phosphate dihydrate, gelatin, hydroxypropyl cellulose, hydroxypropyl methylcellulose, iron oxide, lactose anhydrous, magnesium stearate, mannitol, methacrylic acid copolymer, microcrystalline cellulose, polyethylene glycol, sodium lauryl sulfate, and titanium dioxide. Each delayed release capsule with an opaque apricot body, opaque purple cap, printed in blue-black, "PRILOSEC 40" on the body and "MSD743" or "743" on the cap contains 40 mg of omeprazole. Nonmedicinal ingredients: cetyl alcohol, D&C Red No. 28, D&C Yellow No. 10, disodium hydrogen phosphate dihydrate, FD&C Blue No. 1, FD&C Red No. 40, gelatin, hydroxypropyl cellulose, hydroxypropyl methylcellulose, hydroxypropyl methylcellulose phthalate, lactose anhydrous, mannitol, microcrystalline cellulose, sodium lauryl sulfate, and titanium dioxide. Each pink, round delayed-release tablet, printed "LOSEC 10" on both sides contains 10 mg of omeprazole. Nonmedicinal ingredients: hydroxypropyl methylcellulose, iron oxide, mannitol, methacrylic acid copolymer, microcrystalline cellulose, paraffin, polyethylene glycol, sodium starch glycolate, sodium stearyl fumarate, talc, and titanium dioxide. Each red-brown, round, delayed-release tablet, printed "LOSEC 20" on both sides contains 20 mg of omeprazole. Nonmedicinal ingredients: hydroxypropyl methylcellulose, iron oxide, mannitol, methacrylic acid copolymer, microcrystalline cellulose, paraffin, polyethylene glycol, sodium starch glycolate, sodium stearyl fumarate, talc, and titanium dioxide. Who should NOT take Losec? Omeprazole should not be taken by anyone who is allergic to omeprazole or any of the ingredients of the medication. What side effects are possible with Losec? Are there any other precautions or warnings for Losec? Liver disease: People with severe liver disease should generally not take more than 20 mg of omeprazole daily. Severe stomach problems: If you have recurrent vomiting, difficulty swallowing, blood in the stool, coughing up of blood, or significant unintentional weight loss, check with your doctor immediately. Breast-feeding: It is not known if omeprazole passes into breast milk. If you are a breast-feeding mother and are taking this medication, it may affect your baby. Talk to your doctor about whether you should continue breast-feeding. What other drugs could interact with Losec?